A great day Thursday celebrating the grand reopening and ribbon cutting of the Estuary Golf Course at Grey Oaks Country Club in Naples, Florida. The redesign added needed width to the fairways with greater interest at the green complexes. 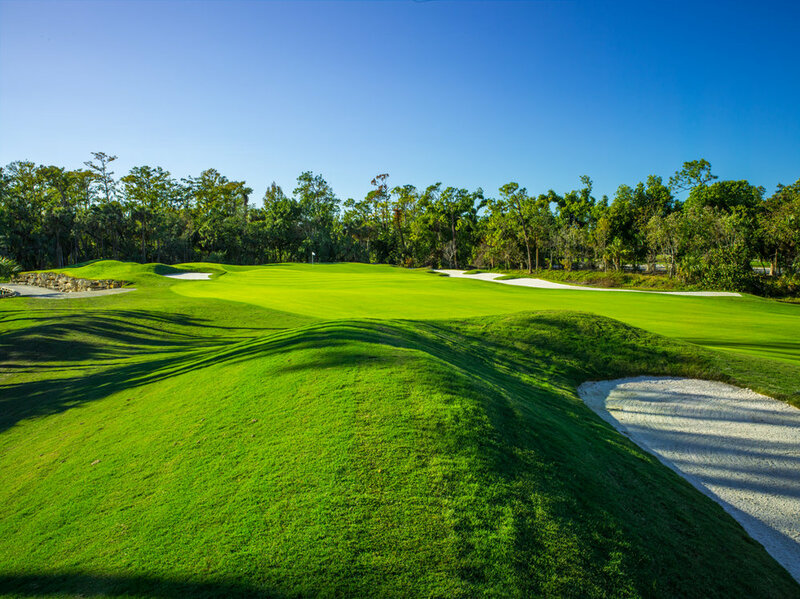 Our goal was to provide new strategy, fun and beauty to this wonderful golf course. Having lived on site during the construction it is always rewarding to see the finished project and members enjoying the results. The improvements included major grading and drainage, new greens, bunkers, a new irrigation system, driving range renovation and the re-grassing of all tees, fairways and greens. A master plan guided our work developed with the club and golf committee the previous year. Here are a few photos of The Estuary Golf Course at Grey Oaks by Laurence Lambrecht. Nice mention of the Duke's golf Course in St Andrews. Joe Passov's Ask Traveling Joe column in Golf.com "The Duke's fortunes changed dramatically in 2005 when Herb Kohler bought the Old Course Hotel as well as the Duke's and invested in new drainage and a redesign by former Pete Dye protégé Tim Liddy. The Duke's isn't links golf, yet its gorgeous, lacy-edged bunkers and thoughtful design make it worth the diversion from seaside play." Another great photo taken this week of golf hole #17 at Colleton River Club by Jake Williams, the golf course superintendent. The color contrast of the different grasses framed by the darker live oaks this time of year is stunning. We remodeled the golf course last year, restoring bunkers throughout the Pete Dye design. The work received an American Society of Golf Course Architects Design Excellence Recognition Award. Great photo taken this week of golf hole #9 at Colleton River illustrating the contrast between the green fairway Bermuda and golden centipede grass surrounding the bunkers. The photo was taken by Jake Williams, the golf course superintendent. We remodeled the golf course last year, restoring bunkers throughout the Pete Dye design. 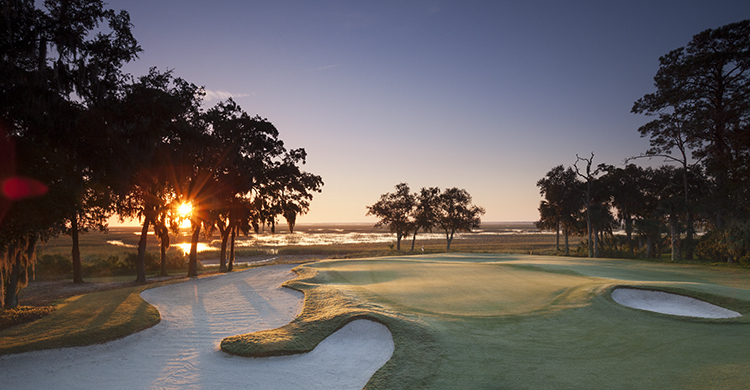 The work received an American Society of Golf Course Architects Design Excellence Recognition Award. Tim Liddy, ASGCA, describes how a Cincinnati club preserved its Donald Ross heritage and charm. How long can a master plan guide a club? Two, five, 10 years? In this example, the master plan completed in 2002 still guides a club today – 15 years later. In 1999, Hyde Park Golf and Country Club, like other well-established Donald Ross courses, was struggling with the concept sweeping most private clubs at the time: give in to current fads of golf course design or re-establish the exemplary design by Mr. Donald Ross that held true for over 80 years? The majority of members did not understand or appreciate the distinct heritage of Donald Ross, what it afforded Hyde Park, and the importance of this historical golf course in Cincinnati and the country. The catalyst to ensure Ross’s classical masterpiece began with Art Fischer, a longtime member. Realizing the historical importance of Ross as the designer of Hyde Park, he quietly began a campaign to educate the club on Ross’s significant design accomplishments and the importance of restoring and preserving his design for the future of Hyde Park. Gradually, the education surrounding the history of Donald Ross and Hyde Park, captured a new and enthusiastic group of members. They respected the creativity of Donald Ross and his wonderful design at Hyde Park. This need was followed by an invitation to architect Tim Liddy and historian Brad Klein to provide a presentation to the membership on Ross and his design of Hyde Park Golf and Country Club. Together, they gave a detailed synopsis about Donald Ross and the importance of preserving Hyde Park’s classic golf course. By 2002, the club hired Liddy to research Ross’s work at Hyde Park and develop a master plan that would honor and showcase Donald Ross’s initial design. Liddy, working with committee members from Hyde Park, developed a master plan to restore many of the features changed from its original construction of 1921. The plan included recapturing greens that had reduced in size over time from typical maintenance practice, tree management, restoring bunkers to Ross’s drawings and restoring the golf course from changes made by other architects over time. The master plan outlined every Ross feature and delineating the distinct character of this classical golf course. Eventually, after years of discussion, green committee meetings, board meetings, club townhall meetings, the members agreed to invest their money towards the critical renovation of Hyde Park’s course to mirror much of the its original design by Ross. It began with the remodeling hole No. 1 back to its original Ross character. This was followed in 2004 and ’05 by a more extensive restoration of the greenside bunkers and fairway bunkers. Then, in 2013, further improvements were made to one of the course’s sentinel holes, No. 13, remodeling it in character with Ross’s original concepts. Over the past 15 years and today, the master plan is frequently utilized as a reference for ongoing projects preserving the Ross heritage and design, redirecting misguided board members or green committee members back to Ross ideals, and the importance of Ross and the character of Hyde Park Golf Course. Today, Hyde Park emulates all that a classical Donald Ross Golf course offers. Members are proud of its heritage, the enduring value it brings to their club, and appreciate the investment and trust they have placed in the master plan. Many times it is the small details we do that gives us the most pleasure. Dan Proctor and I spent many days finalizing the bunker on this special fairway, the Duke's St Andrews 13th golf hole. Not only did it guard the future best approach angle into the green, it accented the wonderful view out over the North Sea and the town of St Andrews. Here is a photo after it was recently constructed. You can see the small heather we planted along the top, blending it into the perimeter fescues. You will also notice the green had not yet been remodeled nor has new planting been added to screen the large home in the background. Here is a photo taken this summer. Notice how well the heather has taken root, softening the bunker edge and transitioning into the adjacent fescue. The bunker adds a foreground to the long view out to the North Sea and at the same time takes the golfers eye to the green. Also see how the adjoining residence is now screened out of view. The green now has been remodeled, bringing this bunker strategic significance. A bunker ten years later and the small details and joys of a golf course architect. Wonderful photo taken this morning on the 18th green at the Duke's St Andrews. We remodeled this golf course in 2006. It is currently ranked 25th best golf course in Scotland by Top 100 Golf Courses. The North Sea looks calm today! Shepherd’s Rock at Nemacolin Woodlands Resort voted as one of the Best New Courses for 2017 by @golf_com. 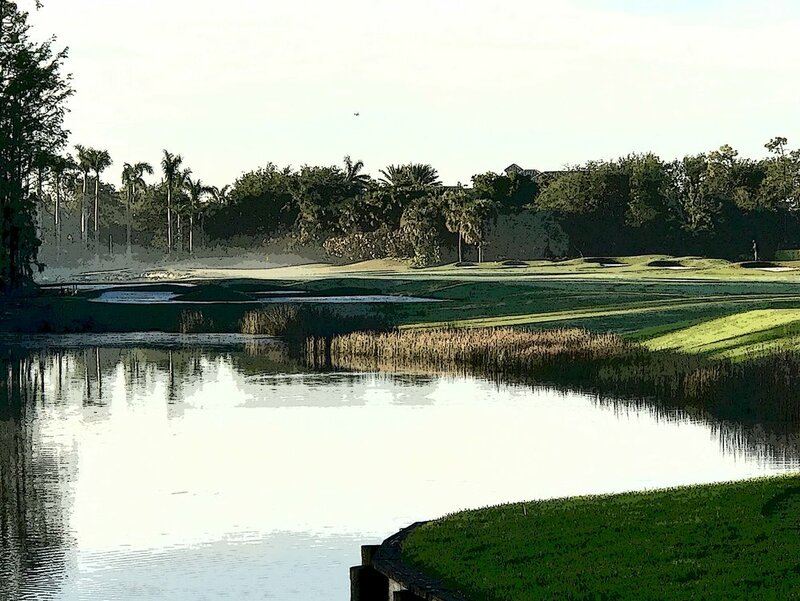 A photo taken by Abe Wilson this morning of the fifth hole on the Estuary Golf Course at Grey Oaks in Naples, Florida. We remodeled the Estuary Golf Course this summer and even with hurricane Irma last month, it will be reopen for play on schedule in late December. A recent photo of my remodel of the Marshwood Golf Course at Skidaway Island, just outside Savannah, Georgia completed in 2003. A beautiful place. Alice Dye rips TPC Sawgrass' new drivable par 4, says "it's not a Pete Dye design"
The new drivable par-4 12th hole at TPC Sawgrass' Stadium Course was supposed to add excitement down the stretch at this year's Players Championship. Instead, for the most part, it was a parade of layups off the tee. And now the most drama surrounding the hole has come after the tournament. Alice Dye, Pete Dye's wife and frequent collaborator, recently weighed in on the big change to arguably her husband's most famous golf course. "It’s an awkward hole," Alice Dye told Matt Ginella for a golfadvisor.com article. "It doesn’t fit the course. He OK’d it, but it’s not a Pete Dye design." OK then. It's not an "Alice Dye design," either. And we say that because it was Alice who is actually credited with coming up with the concept of the famed island-green 17th. But while the legendary architect was swayed by that suggestion, it sounds like he wasn't a fan of reachable par 4s. No matter how they were built. "Pete has never believed in drivable par 4s," Alice added. "If a player is supposed to reach the green from the tee and you’re always allowed two putts, well, that’s a par 3." 2016 was a busy year for my small firm. As it comes to a close I thought I would share a few examples of my work completed this year. My thanks go out to the great contractors I worked with: MacCurrach Golf, LaBar Golf Renovations, Glase Golf, Frontier Golf and Landscapes Unlimited. (last but not least) David Pagel at Grey Oaks in Naples, Florida. Thanks to all, and Happy Holidays. It was a pleasure completing the last phase of a four year improvement plan for Des Moines Golf and County Club as they prepare for next year’s Solheim Cup. Here is the 15th hole. I was the project architect for Pete Dye, living on-site for 3 months, on the new 18 hole golf course at the Nemacolin Woodlands Resort in Farmington, Pennsylvania. Here is the par-4 second hole at Shepherd’s Rock which will open next July. The work at the Dye Course at Colleton River in Bluffton, South Carolina was interesting as I was updating a project I originally worked on 18 years ago. Much of the work was of an archeological nature as we restored many of the bunkers back to their original state. The photo below illustrates the fairway bunkers on hole number two before and after the restoration. I had the pleasure of completing a new 18 hole golf course in Westfield, Indiana with Mr. Dye. Chatham Hills is the centerpiece of a new housing development. I liked it so much I purchased a lot! 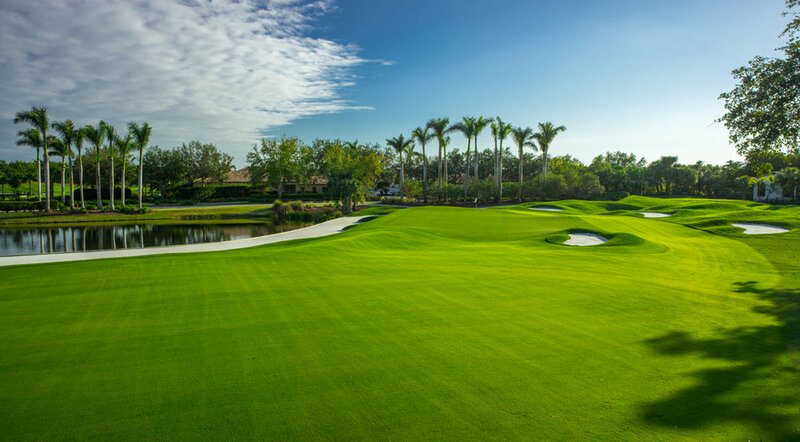 And finally The Palm Course at Grey Oaks in Naples, Florida opens this week after my summer remodel. My article in March/April 2016 of The BoardRoom. In clearing the site line for golf hole #8 at Chatham Hills in Westfield, Indiana we had to leave this tree. Looks like a golfer to me.